Then Jesus said, "A man had two sons. The younger son said to his father, 'Give me my part of all the things we own!' So the father divided the wealth with his two sons." 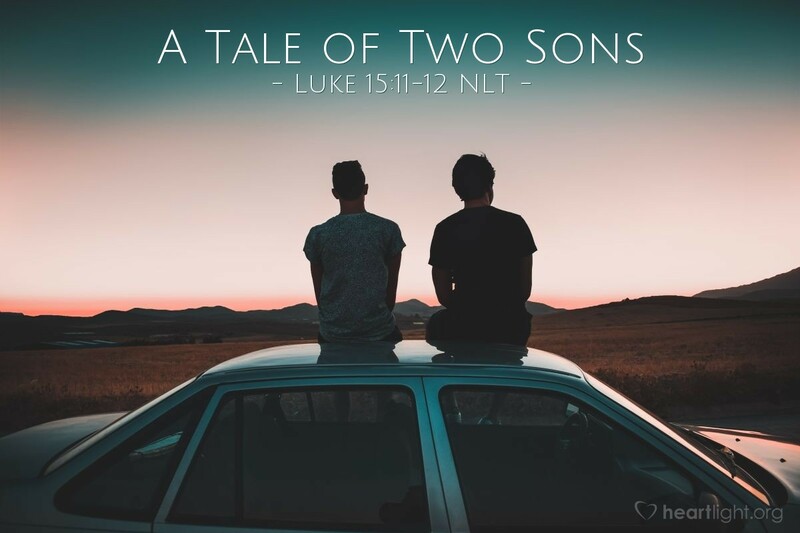 This tale of two sons is told to illustrate God's joy over the return of a sinner. In this story, one son is rebellious and leaves home—he basically tells his dad that he is no better than dead, when he asks for his inheritance before his father dies! The other son, however, never really seems to be at home with the father—he takes his share of the inheritance, the larger share, and stays at home working out of a sense of slaving duty. Neither son knows the heart of the father. Both break his heart as the story progresses. However, the father remains true to his love and seeks to bless and redeem both. My guess is that at different times in our lives, we actually play the parts of each son—self-righteous and loveless like the older son or rebellious and selfish like the younger son. How can we thank God for loving us in either condition and for working with us to help us know what it means to be his forgiven and holy child? Father God, forgive me. I know that I have not always lived my life in a way that has blessed you as my Father. Thank you for your patience and your mercy. Thank you for letting me feel the sting of my sin and the consequences of my rebellion. Thank you for confronting my heart that is unforgiving toward others you have forgiven. Thank you for longing to make my life a place of joy, celebration, relationship, and reunion. In Jesus' name I offer you my thanks and praise. Amen.